Bea's Book Nook: Libraries Around the World! This Month, Iza and the Faidherbe, Paris France Library! Libraries Around the World! This Month, Iza and the Faidherbe, Paris France Library! 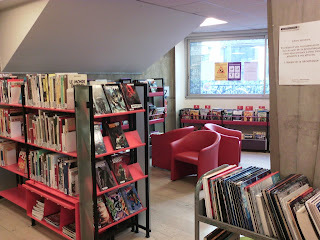 Today's library post is courtesy of Iza, a former book blogger and a librarian in Paris, France. You can find her on Goodreads. Hi, I’m a librarian in Paris. 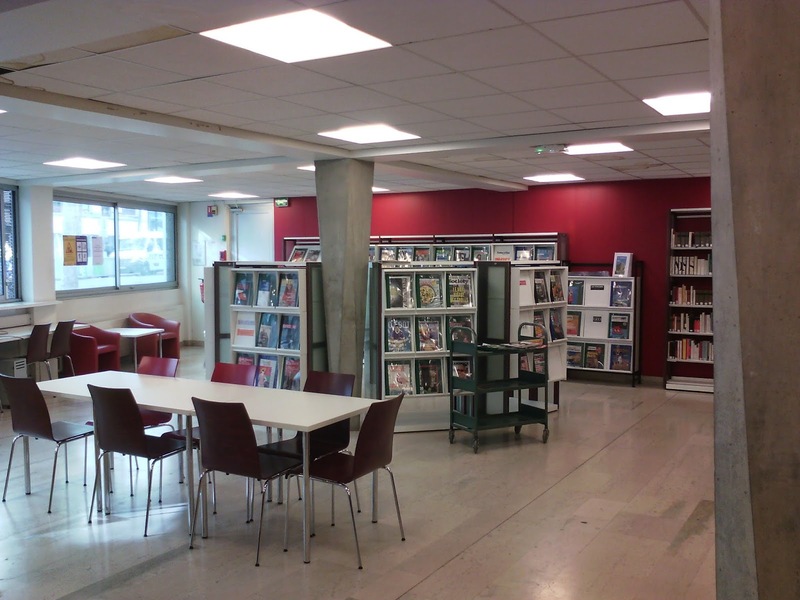 There are more than 60 libraries in Paris where you can borrow documents with only one card. They are funded by the local taxes. - The ground floor and the basement are for the adults ; there are tables, chairs and armchairs – I have already found people sleeping in the armchairs, they must be comfortable ! There’s a copier downstairs to use for a very low fee. And, of course, books ! Even books in English. And magazines, newspapers, comics, audio books. - The first floor is a hall where we hold conferences, concerts and film projections. We hold in particular a series of conferences on the history of art that are a huge success. - The second floor gathers the music CDs (all genres) and DVDs. We used to have only documentaries, but now we also have tv series, theatre plays, humour shows, operas and will soon have movies. 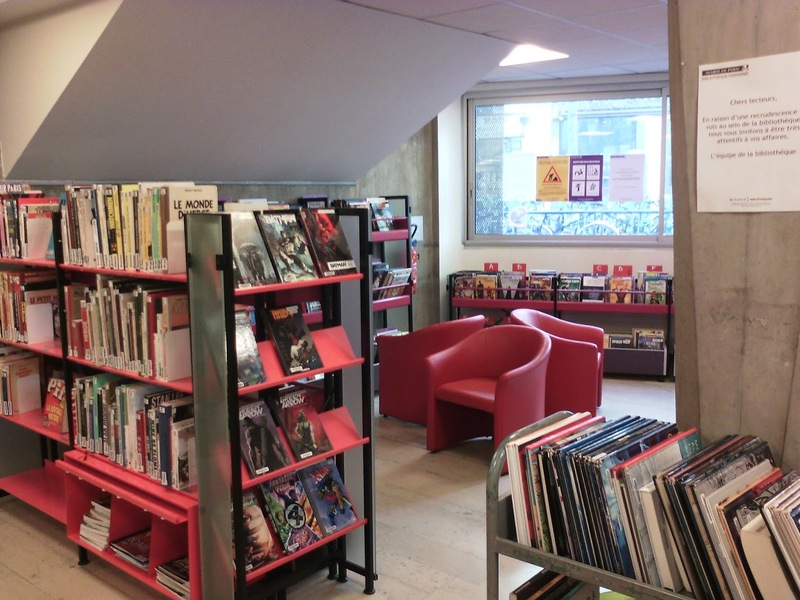 - The third floor is for children : books, comics, CDs, DVDs, magazines, a book club, movie projections and story times.. School classes or nurseries are received when the library is closed. - On the 4th floor : for now, the offices of the adult section. It’s old, dusty and crowded ! - On the 5th floor : we are lucky to have a personal bookbinder, who does a great job in mending and binding our books. - On the 6th floor : a very small, tiny kitchen where 6 people can sit and somehow try to navigate between the chairs/tables, the refrigerator and the microwave, plus a reserve for furniture of all kinds. We’re open Tuesdays, Thursdays and Fridays from 13.00 PM to 19.00 PM. On Wednesdays and Saturdays, from 10.00 AM to 18.00 PM. - Loan of 20 documents per library, 40 if you borrow in all the public libraries of Paris : books, magazines, e-readers, audio books are lent for free, but there’s a fine if they are returned late. - Our documents are lent for 3 weeks, they can be renewed twice if the book isn’t late or if no one has placed a hold on them. A selection of books, CDs, and DVDs are lent for 1 week : those that receive awards, best-sellers and the like. It allows our reader a quicker access to them without an ever-growing waiting list ! - Our CDs and DVDs are loaned in exchange for a yearly fee (30,50€ for CDs ; 61€ for DVDs and CDs) but they can be loaned for free with a minor’s card (0 to 17 year olds) - so the parents use their children's card and save money. The members of the library have access to wi-fi 2 hours each day on our computers (7) or on their tablets/phones/laptops. We used to reserve the computers for the readers, but after a few fights, we decided that the first who gets to the library gets the computer ! No more fights now. We loan headphones for free, but I personaly wouldn’t use them with a ten feet pole (they are never cleaned)… There are 3 computers that can be used with internet for 15mn at a time, and 2 catalogues. No printers, but a USB cable for flash drives. - For the elderly who have trouble walking and/or carrying books, we have two people who visit them with a choice of documents. They just have to phone the library, we list their coordinates and their tastes and voilà. - On Saturday mornings, there’s a librarian available for everyone who asks questions about computers, internet, phones, tablets. I even saw one reader who brought her TV screen that didn't work ! Next month, we’ll be closed for construction work : the 4th floor, our offices, will be turned into a studying room for the library members (or not members, by the way), with computers, electrical outlets and a very small cafeteria. We’ll reopen next January. The adult librarians will move to the 5th floor and our bookbinder will move to the 6th floor. Next month, Christina Maria Rose from All About Romance will tell us about her library in Winnipeg, Manitoba, Canada. 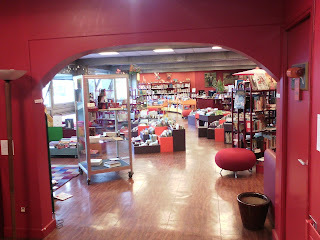 Thank you Iza for sharing your library in Paris, France. It was fun to visit a library in a different country. Wasn't it? So neat to see how libraries work, and what they look like, in other countries. I remember Iza! What fun to see her library! And to see a library in a different country. Hello Isa. I am from India and was at your library on 31st May 2018. Lived the ambience. In fact I donated four of my novels on the same day to the library. I would be thrilled if you could send me pictures of it on the shelves. The books are in English and are called Shreya’s Eighth, Samira’s SIT Venture, The Three on a spree and The Braces Club. Would be delighted if you could have someone review the same.